Lea-Ann Germinder, APR, Fellow PRSA will provide writers and bloggers with real-time tips and take-a-ways as a featured speaker at the 25th Anniversary CWA Conference May 16-18, 2019. Attendees will learn what works now in the rapidly changing digital and traditional media space to engage with pet parents. Communications techniques, best practices and go to resources for both the digital space and media will be covered. As a follow-up to last year’s conference session, the latest developments in transparency and privacy regulation in the social media space and resources will be discussed as a group. Germinder has been a member of CWA since 2000. The conference will be held at the Drury Hotel, St. Louis, Mo. To register for the full conference, click here. “I applaud the Honorees for their achievements and the amazing organizations receiving donations as we conclude our 20th anniversary celebration where it began. It was my distinct honor and privilege to share many of their stories and represent the scope of clients, team members, experts, colleagues and partners that make an agency a success and at the same time help others. These people empower me still. Storytelling works,” said Lea-Ann Germinder, APR, Fellow, PRSA, President + Founder of Germinder + Associates. Germinder + Associates has contributed to a number of initiatives over the past twenty years through both in-kind and funds through the Germinder Giving Back program. The Germinder20 Power of Pink Honoree Program was a special 20th Anniversary project honoring individuals who had been a part of Germinder’s success but have also been successful in their own fields. New programs will be announced as partnerships and funds become available. “This has been an inspiring year and yearlong event. The point it brings home is live your personal dream to “move the needle” on the goal that inspires you. My certainty is that it will inspire our profession and others to do just that. We all work so hard! This focus is such a gift to remind us all to care deeply and act on our conviction that we can make a difference,” said Elizabeth J. Colleran DVM, MS, DABVP-Feline Specialty, Germinder20 Power of Pink Honoree. Following is the complete list of Honorees and donations by category. Thomas Nelson, DVM designated his Honoree donation to the Northeast Alabama Bicycle Association Building Fund to renovate a building to aid in ecotourism and wellness programming. Susan Little, DVM, DABVP designated her Honoree donation to the Winn Feline Foundation to aid in feline research. Arne Zislin, VMD, MBA designated his Honoree donation to International and Immigrant Student Services (IISS) at Johnson County Community College (JCCC) to help international students in crisis. Guy Pidgeon, DVM, DACVIM designated his Honoree donation to Colorado State College of Veterinary Medicine Scholarship Fund to help veterinary students with their debt load. Mary Beth Leininger, DVM designated her Honoree donation to Purdue University College of Veterinary Medicine Scholarship Fund to help veterinary students with their debt load. Dan Richardson, DVM, DACVS designated his Honoree donation to Stormont-Vail Foundation Care Line to help cancer patients in need. Elizabeth Colleran, DVM, MS, DABVP designated her Honoree donation to the Winn Feline Foundation to aid in feline research. Heidi Lobprise, DVM, DAVDS designated her Honoree donation to the Lutheran Church Charities K-9 Comfort Dogs who interact with people who are suffering and in need. Debra Horwitz, DVM, DACVB designated her Honoree donation to the Missouri Humane Society. Manolita Moore, MBA designated her Honoree donation to The Pixel Fund to help shelter pets. Jen Reeder designated her Honoree donation to Green Dogs Unleashed to help rescue, rehabilitate and train therapy dogs. 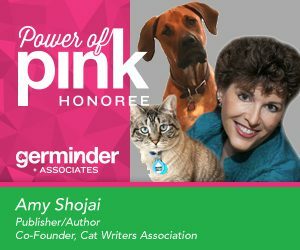 Amy Shojai designated her Honoree donation to the Cat Writers’ Association to assist CWA in helping feline writers educate the public. A Germinder donation was made to the News Literacy Project to teach students to think critically and independently about news and information as producers, as members of the community and as citizens. Julie Lux designated her Honoree donation to the American Beagle Rescue Network to help rescue beagles and to the Dalmatian Club of America Foundation to aid in canine research. Norita Taylor, APR designated her Honoree donation to Band of Angels to help children in need access musical instruments. Megan Peters designated her Honoree donation to KC Pet Project to help shelter pets. Gene Melleno honored with donation to the Clara Goy Foundation to aid in cancer research. Rache Simmons, MD honored with donation to the Weill Cornell Breast Center at Will Cornell Medical College/New York Presbyterian Hospital to aid in breast cancer research. Orli R. Etingin, MD honored with donation to the Daedalus Fund for Innovation, Weill Cornell Medical College for medical education and research. Louis J. Aronne, MD honored with donation to the Daedalus Fund for Innovation, Weill Cornell Medical College for medical education and research. Marie Therese Kacin honored with donation to the Jan Hus Community Outreach Program to assist in community outreach. Thomas O’Hare honored with donation to the Lymphoma Research Foundation. #Germinder20 #ThePowerofPink was announced in January 2018 as part of the celebration of Germinder’s 20thAnniversary. The storytelling initiative highlights the founder’s story of breast cancer survivorship and also shines a spotlight on leaders whose stories have touched and inspired Germinder to success. Germinder + Associates provides communications services for the pet/vet sectors and other niche industries. The woman-owned company was founded by Lea-Ann O’Hare Germinder, APR, Fellow PRSA in Kansas City and has offices in New York City and Kansas City. The company connects and consults with executives in both established companies and organizations interested in entering the vet and pet industries in the U.S.
Goodnewsforpets.com™ combines an award-winning website and social media channels to curate news of interest and importance to pet parents, veterinary professionals and the pet industry. Editorial, contests, sponsored content distribution and advertising are available. GNFP Digital™ provides a wide range of digital services including digital audits, standard or custom infographics, topic specific modules and branded content implementation. The custom digital content development and distribution services are offered for national brands, veterinary practices and other niche markets. “I am so pleased to conclude the celebration of our 20th anniversary honoring another former client, an outstanding leader in veterinary medicine, and a friend. Dr. Nelson not only understands the effectiveness of educating through public relations, he respects what an agency can bring to the client-agency relationship and his dedication to volunteer leadership is extraordinary. You can’t help but succeed with any initiative he’s involved with, ” said Lea-Ann Germinder, APR, Fellow PRSA, President and Founder of Germinder & Associates, Inc.
Germinder has collaborated with Dr. Nelson since his tenure as president of the American Heartworm Society with the launch of several initiatives. Germinder + Associates was the agency of record for the Society and Lea-Ann Germinder played a unique role with the KNOW Heartworms campaign, partnering Zoetis, (then Pfizer Animal Health), AHS and the American Association of Feline Practitioners (AAFP) with the late Jim Richards, DVM, DACVIM, AAFP spokesperson and former director of the Cornell Feline Health Center, to educate veterinarians and the public about feline heartworm. Dr. Nelson and Germinder’s commitment to help educate the public about feline heartworm and feline research remains in large part as a lasting tribute to Dr. Richards’s love of feline medicine. “Honoring Dr. Little is a great way to kick off 2019. 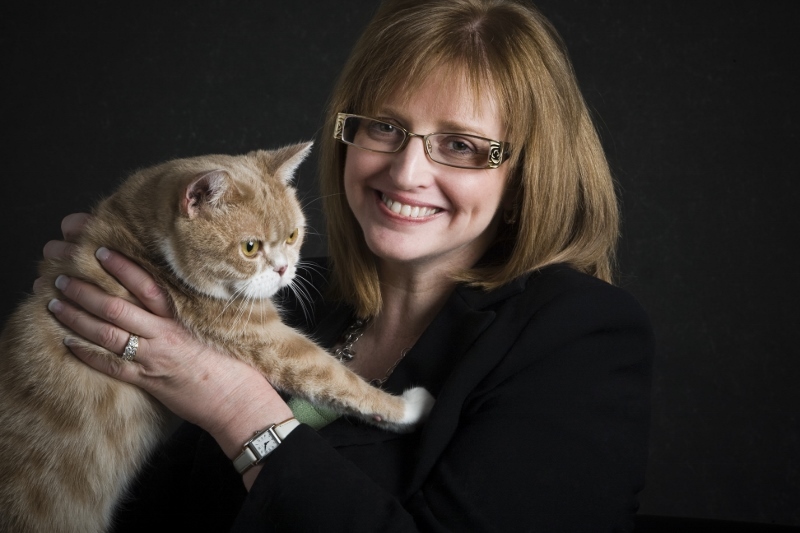 Germinder is committed to communicating about best global veterinary medicine practices and Dr. Little is an exemplary ambassador of feline veterinary medicine all over the world. Her positivity inspires me and every person wherever she goes. She is a leader par excellence and certainly one to follow as she lectures, as she podcasts, and in our ever changing digital world. 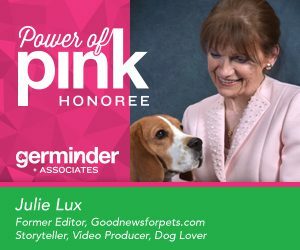 I’m so pleased to celebrate her as a Power of Pink Honoree,” said Lea-Ann Germinder, APR, Fellow PRSA, President and Founder of Germinder & Associates, Inc.
Germinder met Dr. Little several years ago during Dr. Little’s co-authoring of a feline textbook with the late Mordecai Siegal, the editor of “The Cornell Book of Cats” and one of the first columnists of Goodnewsforpets.com. Thus began Germinder’s commitment to help educate the public about feline medicine and in particular feline medicine research. Germinder + Associates designed the Winn Feline Foundation logo when Little was president. The logo is still in use today. To read the full release, click here. Living Coral is the 2019 Pantone Color of the Year, What’s Yours? Pantone, provider of professional color standards and digital solutions for the design industry, announced in early December PANTONE 16-1546 Living Coral as the Pantone Color of the Year 2019, an animating and life-affirming shade of orange with a golden undertone. Germinder + Associates selected a Pantone Pink for our new brand in 2018 to celebrate our 20th Anniversary and more. We love it in all shades and plan to continue to celebrate our new hue in 2019, but we’ve always embraced the use of color to bring a cohesiveness to a corporate brand’s message across multiple products and multiple communications platforms. We thought it would be fun to share Pantone’s thought processes behind the Color of the Year process as they celebrate their own 20th anniversary of this initiative in 2019. Pantone further explained the selection is in reaction to the onslaught of digital technology and social media increasingly embedding into daily life, people are seeking authentic and immersive experiences that enable connection and intimacy. Sociable and spirited, the engaging nature of PANTONE 16-1546 Living Coral welcomes and encourages lighthearted activity. Symbolizing our innate need for optimism and joyful pursuits, PANTONE 16-1546 Living Coral embodies our desire for playful expression. PANTONE 16-1546 Living Coral emits the desired, familiar and energizing aspects of color found in nature. In its glorious, yet unfortunately more elusive, display beneath the sea, this vivifying and effervescent color mesmerizes the eye and mind. Lying at the center of our naturally vivid and chromatic ecosystem, PANTONE Living Coral is evocative of how coral reefs provide shelter to a diverse kaleidoscope of color. Here is how Pantone sees the color playing out…. An organic shade, Living Coral is striking in digital mediums, evoking the same inspirational feeling ignited by our natural surroundings. Living Coral’s vibrancy and buoyancy captivates our attention in social media and digital design. Living Coral inspires experimentation and playful expression in both men’s and women’s street and runway styles. The warm shade suggests comfort and positivity in simple color stories, but becomes more explorative and effervescent in patterns, textures and even monochrome looks. An appealing accent shade, PANTONE Living Coral provides a striking contrast across the color spectrum. As a life-affirming hue that complements all skin tones, PANTONE Living Coral brings natural color to beauty in blush, eye and lip. Uninhibited, playful looks are also emboldened by Living Coral, which, as the center of a kaleidoscope of color, encourages experimentation in beauty with palettes, textures, shimmers and sheens. Living Coral is naturally suited for product across all ages and genders. Materials with texture and convivial colors such as PANTONE 16-1546 Living Coral appeal to our desire for products exhibiting humanizing and heartening characteristics. When used as a bold statement in settings and décor, Living Coral fosters immersive experiences such as pop-up installations and interactive spaces, tied to a playful spirit. As a color linked to tactility and human connection, PANTONE Living Coral in shag rugs, cozy blankets and lush upholsteries create a warm, comforting and nurturing feeling in the home. With its ebullient nature, PANTONE Living Coral adds a dramatic pop of color to any room setting whether in decorative accessories, tabletop, or on the wall. Living Coral is naturally ideal for packaging applications. Warm and welcoming, this life affirming shade invites us to reach out and touch. The color selected as the Pantone Color of the Year 2019 was taken from the Pantone Fashion, Home + Interiors Color System, the most widely used and recognized color standards system for fashion, textile, home, and interior design. Here’s to Living Coral and Happy Anniversary Pantone! “I am so thrilled to conclude Germinder’s anniversary year by honoring Dr. Zislin. I can sing his praises to the moon and back about his great counsel to me about complex veterinary issues from the time I launched Germinder + Associates, but it is his passion for helping generations to come find their way – be it future veterinarians or not that I have always admired. His “dogged” persistence to find the funds to develop programs that will make a difference in the lives of so many is to be commended. He brings value, meaning and depth to every relationship, every organization he touches,” said Lea-Ann Germinder, APR, Fellow PRSA, President and Founder of Germinder & Associates, Inc.
Dr. Zislin was a technical services manager at Fort Dodge Animal Health when Germinder launched several pharmaceutical and vaccine programs. They worked collaboratively on several strategic initiatives that led to the development of award-winning programs together including a program called “Healthy Cats for Life” with the American Association of Feline Practitioners, one of the early forerunners of feline wellness programs. Dr. Zislin has twenty-two years experience in the animal health industry with Fort Dodge Animal Health and Boehringer-Ingelheim providing technical support and liaison with key opinion leaders. He has successfully participated in numerous product launches and provided subject matter expertise. Two successful projects of note are his development of an Academic Liaison Program to veterinary colleges and the development of distributorships resulting in significant sales growth and key relationship building in Eastern Europe and in particular in the Czech Republic. He is a strong advocate of membership in organized veterinary medicine and is a member of the American Veterinary Medical Association, the American Association of Feline Practitioners (Board of Directors 2019-2014), the International Society of Feline Medicine, the Kansas Veterinary Medical Association and the Kansas City Veterinary Medical Association. “Lane joined Germinder + Associates at a time when we were one of the few public relations firms offering digital capabilities. She was completely undeterred. She took on every presentation, every sold project with dedication and extraordinary attention to detail. The clients were overjoyed, and she never failed to make a project shine. I was delighted when several years later she told me she was thinking about launching her own firm. With Lane, there are no surprises – she just delivers over and over again,” said Lea-Ann Germinder, APR, Fellow PRSA, President and Founder of Germinder & Associates, Inc.
Odle was a senior account executive at Germinder + Associates responsible for executing several animal health websites and campaigns in veterinary medicine. Her detailed approach and web project management skills led to several GKC-PRSA Prism awards. As owner of her own firm, Odle now works on digital content and strategic planning. She recently won the Society of Marketing Professional Kansas City’s (SMPSKC) Best in Show for a Branding Campaign in conjunction with Affinis Corp, a civil engineering firm. Odle has owned Dotted Line Marketing since 2012. To read the full release, click here. “Norita is not only an especially gifted communications executive, she’s an exceptional team builder and manager of people. I am grateful for the time she spent at Germinder + Associates, how she nurtured the smallest of ideas into successful programs for our clients, how she developed her career, and how she has led the Kansas City chapter of PRSA as president this year,” said Lea-Ann Germinder, APR, Fellow, PRSA, Founder and President of Germinder + Associates, Inc.
Taylor has served as Public Relations Director at OOIDA since 2007. Germinder and Shojai first met when the CWA hosted its conference in Kansas City. When Germinder launched Goodnewsforpets in 1998, Shojai embraced the concept from the beginning and signed CWA on as the first media sponsor of the site as a way to promote member books and accomplishments. Since that time they have collaborated on many other projects and ways to promote CWA sponsors and members. It’s that collegial spirit that Germinder treasures the most. “I’m so thrilled to announce Amy Shojai as the 11th Honoree. She is the best of collaborators. Now we get to celebrate her — the launch of her Write Schtuff Coaching webinar series, honor her mentoring and coaching of writers through the years, and celebrate again her co-founding of CWA with the 25th Anniversary of the CWA Banquet and Conference in St. Louis next year,” said Lea-Ann Germinder, APR, Fellow, PRSA, Founder and President of Germinder + Associates, Inc.
Amy is a certified animal behavior consultant, and nationally known authority on pet care and behavior. Her newest project is her “Write Schtuff Coaching Series”. The online presentation is live and recorded for replays, in which she ask attendees what they need and want, answers questions, give a PowerPoint presentation, offers handouts and other perks, and recommends no-to-low-cost resources that she’s found helpful in her own work. For the full release, click here. 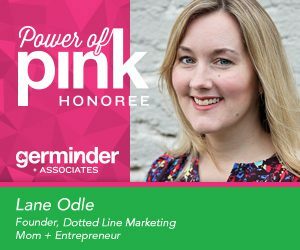 “I am truly honored to be recognized among this outstanding group of individuals receiving the #Germinder20 #PowerofPink award. I remember when Lea-Ann first told me about her vision for Goodnewsforpets.com and I knew then that it would be a great success! I applaud Lea-Ann’s vision and wish Germinder + Associates many more years offering this great resource for the pet media and for all people who love pets. It’s been my pleasure to play a small role in its evolution, ” said Julie Lux, Vice President, Public Relations of FLM Harvest. Copyright ©2018 Germinder & Associates, Inc. All rights reserved.